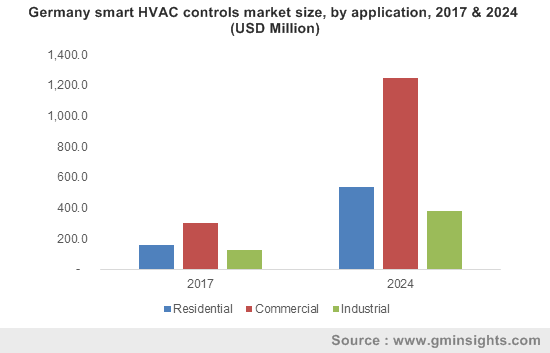 Smart HVAC Controls Market size was over USD 7 billion in 2017, growing at a CAGR of 19% from 2018 - 2024. The global shipments are expected to surpass 250 million units by 2024. Smart HVAC controls market growth is expected to grow over the next six years due to the rapid penetration of Internet of Things (IoT). Manufacturers are integrating HVAC systems with IoT technology. Manufacturers are programming the systems to work in real-time with the other connected systems such as powered window shades and door locks. The increasing M2M connectivity is encouraging users to use intelligent systems in HVAC units. Moreover, the companies are using components including sensors to collect real-time information and monitor indoor environmental conditions to enhance the user experience. These devices also use the already installed components in smart homes to collect information. Growing use of the intelligent sensor technology will propel the demand for the HVAC controls market during the forecast timespan. Energy management initiatives by the governments in light to environmental degradation are expected to propel the smart HVAC controls market growth. In several countries, regulations have been put in place to ensure that buildings have smart heating & cooling systems to improve their energy efficiency. For instance, the European Union has passed a directive, which states that all new buildings must be nearly zero energy buildings by December 2020 and December 2018 is the deadline for public buildings. Conventional buildings show high inefficiency as they emit considerable amounts of CO2, leading to climatic changes. According to a study conducted by the American Council for an Energy Efficient Economy, the use of smart HVAC allows the saving of energy costs of about 5% to 15%. Lack of awareness regarding the benefits, low energy costs, and substitutions from wired to wireless sensor network may hamper the smart HVAC controls market growth. The initial installation costs of these systems are high and discourage small users from installing these systems. Furthermore, the complexity involved in retrofits of existing buildings and the lack of product differentiations due to heavy investments are among the challenges faced by industry participants. Thermostat demand is expected to grow rapidly in the smart HVAC controls market with a CAGR of over 15% due to an extensive use in cold countries. Low costs and the easy installation of stand-alone thermostats make these devices popular in countries including Germany, UK, and Russia. Easy configuration and integration with other smart home appliances have encouraged users to implement these systems on a large scale. However, despite a high growth, the revenue contribution of these products is low as most homes are expected to have a single thermostat by 2024 and most users in countries including China, Japan, and India do not use these. Smart air vents shipments in the market are expected to grow during the forecast timespan owing to an increasing user demand to control air flow in the rooms. These devices regulate heating & cooling air flow on a room-to-room basis, t increasing efficiency and comfort. These devices are being widely adopted as they are cheaper and aesthetically pleasing as compared to the zoning systems and give users a complete control of the airflow in their homes. Residential HVAC controls market is expected to gain momentum due to the growing use of these systems integrated with smart homes. Residential users are installing these systems due to ease-of-use and accessibility. Increased energy efficiency of these devices has encouraged users to implement such systems in households due to a reduction in energy expenses. The adoption of smartphones to control these devices through apps is further aiding the popularity growth of these devices in residential applications. Increasing regulations pertaining to the development of energy-efficient buildings are accelerating the market growth in commercial applications. Commercial applications are expected to constitute about 40% of the total smart HVAC controls market in 2017. Commercial buildings require centralized HVAC controls due to regular in & out-flow of people in the buildings. Furthermore, the growing trend of smart building technology and building automation in commercial spaces will propel the industry growth. The Germany market valued at over USD 590 million in 2017 is expected to grow rapidly owing to a high focus on energy management and efficiency. Several users in the country are increasingly adopting systems that enable them to control sunlight, humidity, and temperature to enhance the in-house comfort. Continuous improvements in building structures and widespread technology adoption in the country are expected to propel the demand for these products over the forecast timespan. Furthermore, Europe may also witness a significant growth as it aims at mandating energy-efficient systems by promoting policies such as tax credits combined with the increased penetration of technology-based buildings. The Asia Pacific smart HVAC controls market is expected to grow significantly over the forecast timespan, particularly in the air conditioning segment due to the adoption of the latest technologies including the Variable Refrigerant Flow (VRF) technology. Governing bodies are implementing several measures such as using smart HVAC to address concerns such as global warming. These bodies are encouraging manufacturers to make the systems more energy efficient, propelling the industry growth. 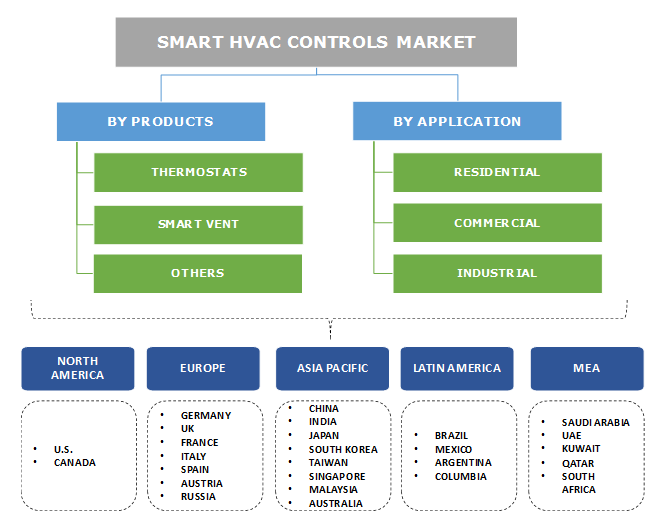 Key players in the smart HVAC controls market include Nest Labs, United Technologies, Lennox Intl, Haier Group, Ingersoll-Rand PLC, LG electronics, Daikin Industries Ltd., Honeywell International, Delta, Lenox International, Siemens, Distech, Hitachi Ltd., KMC Keen Home, Schneider Electric, and Johnson Controls. These players are continuously investing in the development of innovative products that are technologically advanced and can be integrated with other products such as smart lighting. For instance, Nest Labs developed Learning Thermostat, a sensor-driven, programmable, and Wi-Fi-enabled thermostat that can be adjusted according to heating & cooling requirements. Growing consumer inclination toward smart devices may force players to innovate new devices in order to gain a competitive advantage in the market. The development of smart HVAC controls market started with the development of building automation systems consisting of automated & centralized HVAC control. With the growing adoption of these solutions in industrial and commercial applications, manufacturers started developing products that could be used for residential applications. The implementation of these products in several applications is one of the necessary measures to enhance the energy efficiency of buildings. The growing trend of integration of these systems with intelligent home products and the unified control of these systems using smartphone apps will result in a widespread adoption of the market.